It’s the final count down to the big night of the carnival! 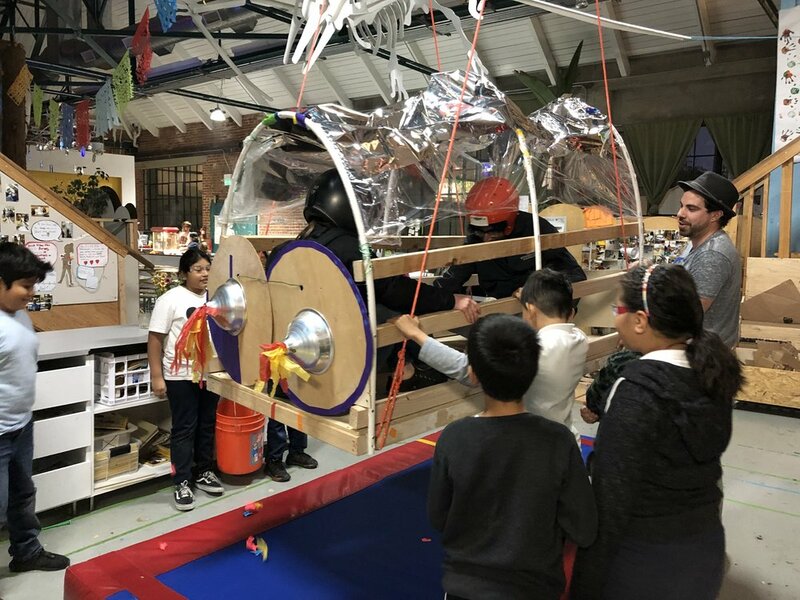 Both teams worked with focus and persistence to have their rides finished in time for everyone to get to try them out and show off their accomplishments to their guests. Katie and Jasmine made sure to stay safe in the chopsaw room even in the midst of the growing excitement. Zadrien and Wallace worked as a team to finish attaching the rear supports on the gravitron, while Joshua and David worked together to cut the paneling that covered the supports. Team work was ESSENTIAL these last weeks to accomplish everything the team wanted to build. Wallace and Zadrien, Joshua and David, and Liana and Joanna all split into pairs and took on a necessary role in this last week. They all persisted through wonderful mistakes and occasional frustrations to finish adding on the needed structural safety bracing for riding the gravitron. Over on the rocket side, Brendon worked with Ailee and Amanda to finish attaching the rear wall to one of the rockets. While Narett, Jasmine and Katie added the back paneling on the other rocket. Again both teams split into two groups to accomplish more together. Then, before we all knew it, the 8th week was upon us and it was Carnival night! We put out the lights, wrote up welcome signs, made tickets and did a last few additions before testing our creations. Annie and Brendon added the last few screws to the trap door, while Ailee added on a roof. Annie was a little nervous using the drill, so Brendon offered a partner push. Jasmine and Yareth worked on adding rocket jets and making fire come out of them. Joshua and Wallace added pin-wheels while Zadrien and Liana drilled down the ball catching buckets on each seat. Then finally it was time! 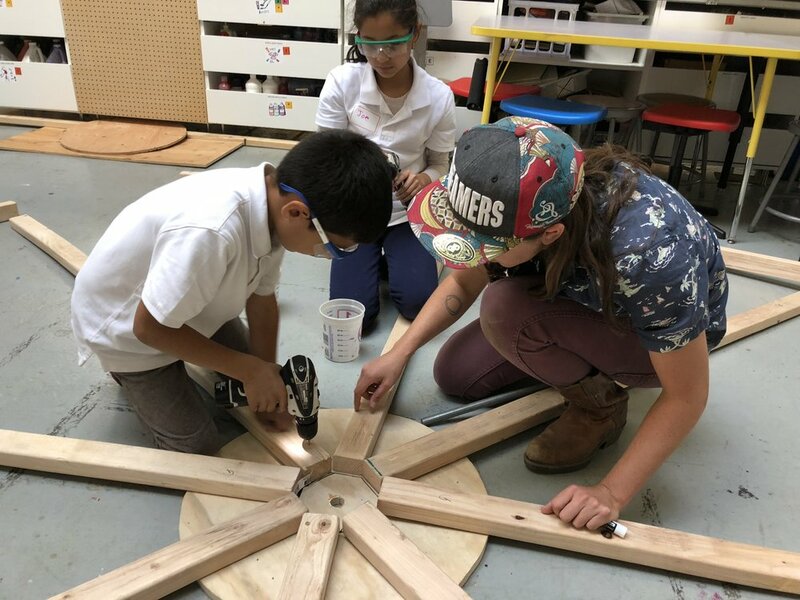 As per Tinkering School tradition, the adult collaborators safety tested each ride before the younger tinkerers climbed aboard. First to test were the rockets. Omar and Katie went in first, both with helmets, and…the rockets worked! Quickly to follow after were the tinkerers themselves. Then it was time for the gravitron. We went over the safety rules we had agreed to and after a preliminary test for structural safety…we let it rip! While the gravitron spun around, the riders would hold onto the buckets for stability while other kids tried to throw balls into them. All kids (young and old) had a blast! This session was a total success and everyone accomplished so much! To see all the fun from these past eight weeks check out our Flickr page for more photos! We split up into two groups and started drawing our individual design ideas. The design constraints this fall are to build one ride that spins, and one ride that swings. Annie and Amanda worked diligently on their design for the swinging ride. After completing the individual drawings, everyone shared their ideas with their project groups and then incorporated all of them into two big designs. Finally it was time to collect materials, measure, and begin cutting and attaching! Omar provided an excellent vertical reference for how tall a roof might need to be. Over the course of week 2-4 of our Tinkering session, the kids have had many opportunities to practice their building skills. It’s so great to see their confidence and comfort growing as they use large power tools, even ones that intimidated them initially like the chop saw! 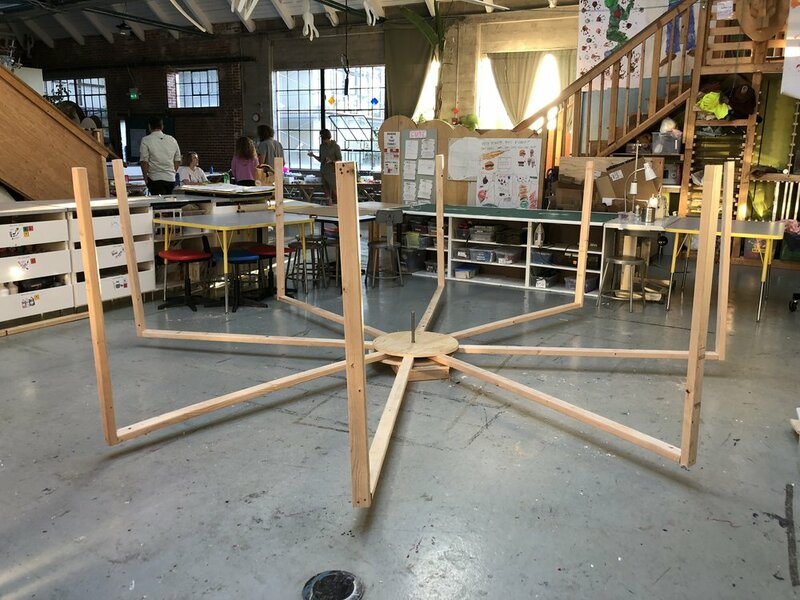 The tinkerers started out by creating a giant weblike frame structure that will support the floor and walls. The “legs” were sandwiched by two round plywood disks for extra support and to provide a place for an axle to go through. And “voila!” look how much they accomplished! They even attached caster wheels to the outside edge of each of the legs so the whole structure could spin. It worked! The swinging team also came up with a super exciting idea to have two rockets with riders sitting in them swing past each as if they were attached to the end of some giant scissors. With their plans in hand, they got straight to work cutting out frames and floor panels. Naret was excited to use a jig saw for the first time! She and Jasmine cut out a circle hatch out of the floor for riders to enter the rocket through. Jig saws can only cut by moving forward, not down. Rather than cutting a line to reach the circle outline, Jasmine used a large drill bit to cut a hole in middle of the plywood. That way the jig saw had a space for the blade to start from. Amanda and Annie worked on constructing the frame for the second rocket. Such amazing teamwork! Everyone in the team took turns trying out the jig saw. It was the first time using one for many of our young tinkerers. After their initial nervousness, it was awesome to hear several exclamations of “that was fun!” Its a joy for all of us as collaborators to see the lightbulb switch on for so many kids as they realize they are capable of using real tools to build amazing things they never dreamed they could make before. It’s been a blast having the Mission clubhouse crew with us again and we can’t wait to see their progress next week! To see photos from the all the sessions so far, please visit our Flickr page. Stay tuned for more epic tinkering next week! 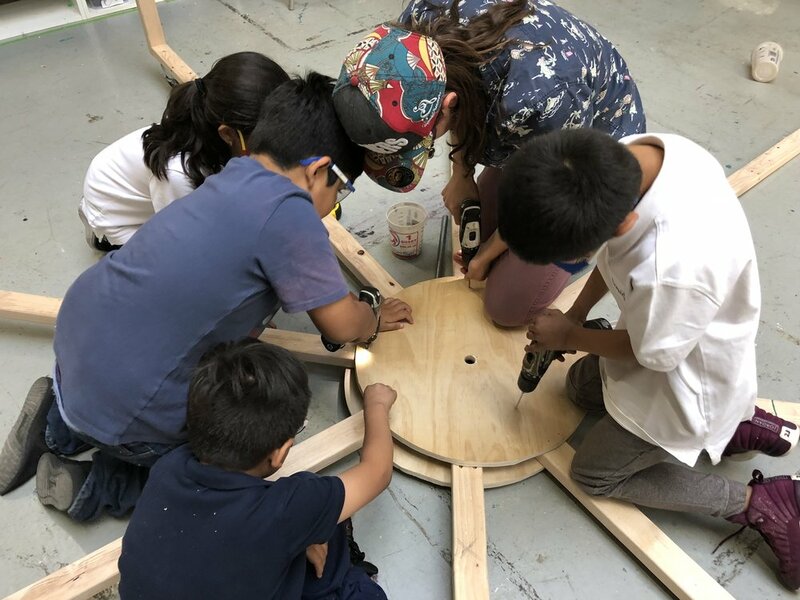 We’re thrilled to begin the 2018 school year with another 8 week Tinkering program with the Boys and Girls Clubs of San Francisco - Mission Clubhouse! We invited 13 young, enthusiastic club members to our work shop and we jumped right in by creating some group safety agreements and talking about our Tinkering School goals. Next up, it was time to get our hands on some tools! 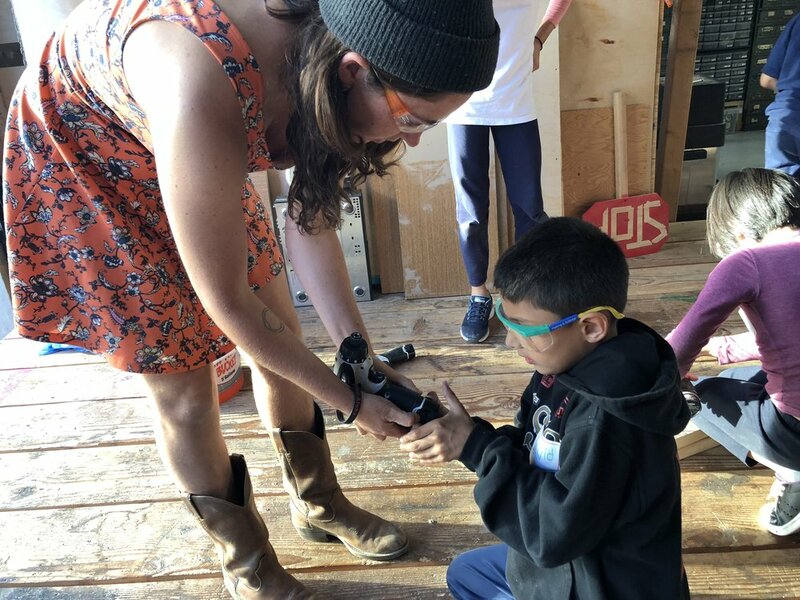 We always start each Tinkering program with a safety tool training on the the three tools we end up using the most: drills, clamps, and the chop saw. We have a couple tinkering alums in this group, so for them it was a chance to practice their building skills. For many of the others, it was their first time using any these tools. Exciting! The kids inspected their drills first without batteries. They learned what the many buttons do as well as how to insert and remove drill and screw bits. The kids quickly discovered how collaborating makes tinkering so much easier and it feels good too! There were lots of opportunities to help one another hold down pieces of wood while the other drilled. Joanna tested different ways to clamp two pieces of wood together. End to end, the pieces fell apart easily. Overlapping the pieces gave lots of room for the clamp pads to pinch the wood. They didn’t budge! Lastly, but certainly not leastly, the kids were super excited to use the chop saw! Evan, one of our Tinkering Collaborators, has the kids feel how hard lumber is compared to their fingers and arms. Its important for everyone to have a healthy respect for how easily the saw can cut things and why its important to follow our safety rules. By following these rules, and always having an adult collaborator supervising, the saw is a very safe tool to use. Such a busy and fun first day! We’re excited to welcome Mission club back next week and to reveal the theme of our Tinkering project. The kids can’t wait to start designing and building and soon they’ll have a chance to do just that! Stay tuned for more next week and in the meantime you can visit our Flickr page to see more of the days’ activities!